NEW YORK—Named Adventurer of the Year by National Geographic, Pemba Gyalje Sherpa is one of the lucky few who have summited the “Savage Mountain,” K2, and can call mountain climbing their profession. “Climbing is a very extreme sport, physically, mentally, and technically,” Gyalje said. But in the recent documentary “The Summit,” director Nick Ryan turned to Gyalje to figure out why 11 out of 18 mountain climbers perished during the 2008 international expedition to summit K2. “Everything depends on the person, on psychology, his expedition role, his physical capacity, his high-altitude experience,” Gyalje said during an interview in New York City. The 2008 expedition gained attention not only because of the high death rate, but also because the international community questioned the reasoning behind large expeditions, funded by the public, to reach peaks like K2, which claims the lives of one in four who try to scale it. As a Sherpa, a member of the Nepalese community that lives by the Himalayas and typically helps as porters during expeditions, Gyalje attributes his long-standing position as a mountain climber to the spiritual foundation of the Sherpa people. “We have very strong beliefs in nature,” Gyalje said. The Sherpa people have immense respect for the mountain and consider it as a god. “It’s a sacred land,” he said. Gyalje said that he still studies the technical skills and technology practiced by Western climbers, but it’s the balance between the two that helps him stay safe and confident during a climb. He said that experience with nature is the most important thing for a climber. His experience over the years has built up an internal compass that helps him determine whether the conditions for climbing are favorable and whether he’s ready to ascend. “I can understand if the mountain is happy or not,” Gyalje said. Gyalje started as a mountain guide when he was only 15 years old. He climbed his first 19,685-foot peak when he was 16, and along with other major peaks, he has summited Everest six times. Interestingly enough, one of the climbers who returned from the 2008 expedition said in the documentary that if you want a good birthday party story, you climb Everest, but if you’re a professional climber, you conquer K2. Large international expeditions pose barriers such as cooperation and language. But the biggest challenges begin after the 26,246-foot mark, also referred to as the “death zone.” In this zone, the air’s extreme oxygen depletion leads to the brain’s inability to make fully rational decisions. “I have seen, multiple times, accidents on the mountains and some casualties … K2 was one of the worst I’ve seen,” Gyalje said. Although he’s seen it all, Gyalje said he can’t live without climbing mountains and that if he doesn’t ascend at least once a year, he feels uncomfortable. “When I’m climbing the mountain, I get some energy,” he said. Gyalje is still very active in his career as a mountain guide. If the conditions are right, he might ascend K2 again. “I cannot decide myself; I need permission from my family members,” he said. Gyalje has two children (10 and 4 years old) with his wife, who is confident of his climbing skills but still worries for him when he’s conquering the world’s tallest peaks. 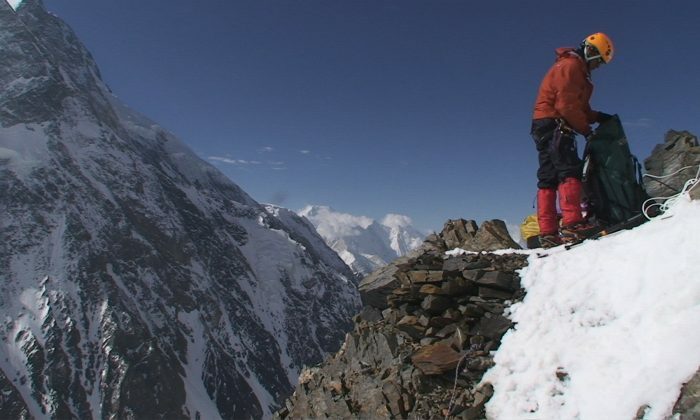 “The Summit” is now showing at the Lincoln Plaza Cinemas and Landmark Sunshine Cinema.